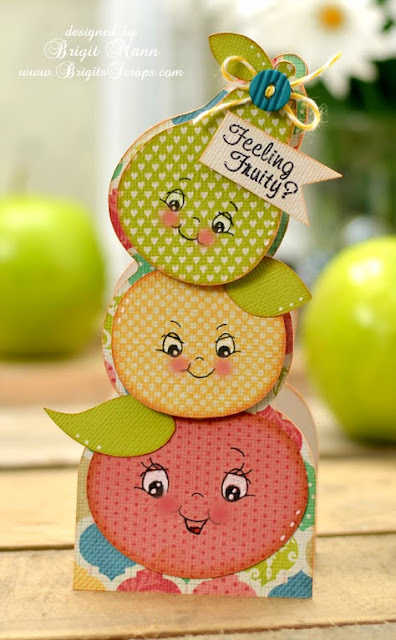 I'm still in summer mode so when I saw the Jack O'Lanterns card in the new kit Maple Manor from SVGCuts I thought fruit. I just added a couple of leaves, Peachy Keen faces, Lemon Tart Trendy Twine which is on sale right now and a stamp sentiment from Jaded Blossom set Feeling Fruity. Digital paper is from Echo Park's Beautiful Life collection, this paper is so pretty. This is so super adorable Brigit!!! Another awesome card!! That is an amazing kit from SVGcuts... but love the fruity twist you gave the halloween card. Cute! This just makes me smile Bridget!! Beautiful, I love your card!! !